Yeah, he’s a comedian. Yes, he’s out of office, but it just adds another chapter to the Left’s ever-entertaining meltdown over the presidency of Donald J. Trump. At the same time, I have to give a hat tip to Al Franken. The man has evidently reached the point of screw it with this tweet. I don’t like it, but it’s gutsy—for all the wrong reasons. On the flip side, take it like this: Trump lives rent free in some liberals’ heads. “How dangerous is Trump? It’s not the time for Mattis to tell Trump that he’s taking the nuclear codes away from him. It’s time for Mattis to give him the wrong codes,” he wrote. How dangerous is Trump? It’s not the time for Mattis to tell Trump that he’s taking the nuclear codes away from him. It’s time for Mattis to give him the wrong codes. Yeah, he’s dangerous because…he beat Hillary Clinton? That’s the benchmark for dangerous in Democratic minds? When it comes to acting like petulant children, Democrats will always take the lead, no matter how bad the GOP becomes. Trump beat Hillary therefore a constitutional crisis, therefore dangerous, therefore, we need to impeach, but if we can’t—give him the wrong nuclear codes. Franken is so late to this party; the apocalyptic nuclear war started because of his Twitter account has come and gone. No war. On the contrary, it led to a historic summit between the U.S. and North Korea on denuclearization. It led to North Korean Kim Jong-un meeting South Korean President Moon Jae-in on southern soil. More talks are expected this month. Will anything come of this? We’re dealing with a closed, authoritarian society. It’s all up in the air, but the point is no war occurred. Diplomacy happened, which is something liberals said could never be done under Trump. It happened. At every turn, the Left fails miserably in checkmating this presidency, and they’re even worse prognosticators. Democrats and the elite media love to highlight the negative, froth with rage over the smallest of things to the point where even the most skeptical Republicans, who really weren’t sold on Trump, are flowing into his camp due to the overreach. Also, Mattis would never do this. The whole tweet is nothing but a fix for the unhinged Left, who still cannot get over that we gave their politics, their agenda, and their ideas a huge middle finger in 2016. 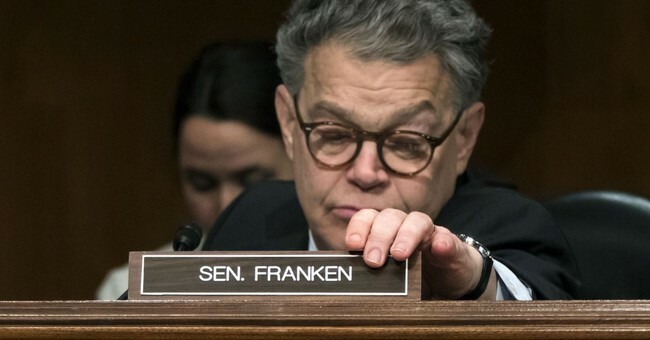 As for Franken, well, he can enjoy his free time. He can tweet these insane things. He’s out of a job. He resigned in disgrace last Thanksgiving due to multiple allegations of sexual misconduct, including groping, were lobbed at him from multiple women. So yeah, we have a real moral authority speaking here.